Horizon Retail Construction is currently working on a large renovation project at a mall in Buffalo, New York and as part of this needed to remove part of the concrete flooring to install new equipment. Since Horizon always uses Ground Penetrating Radar Systems, LLC. 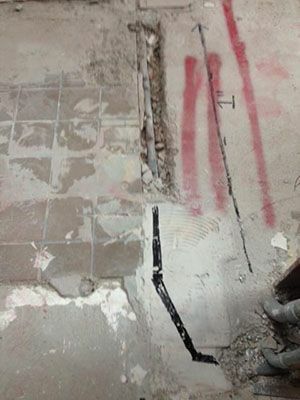 prior to drilling or cutting into concrete to ensure they will not damage the reinforcing steel or any conduit under the surface they gave GPRS, LLC. a call. Jim Bell of the Upstate, New York office, which focuses on the Buffalo, Rochester, Syracuse, Ithaca, and Albany markets mobilized to the site and was able to quickly detect and lay out the lines running through the area in which the slab would need to be removed. Jim and GPR were able to complete this project in real time and with none of the radiation concerns that come with using x-ray. Ground Penetrating Radar Systems has the ability to locate and map out rebar, post-tension and conduit prior to saw cutting and trenching.